Even if you travel to Japan often, you won’t be an expert in Japanese print-making. You can, however, become an expert on one of Utagawa Toyokuni III’s works. · hand-written calligraphic greeting for the recipient. Utagawa Tokoyuni III (1786-1864) was the most talented pupil of Toyokuni I who was considered to be one of the most influential Ukiyo-e artists. Utagawa Tokoyuni III’s later masterpieces reflect the taste and customs of the closing decades of The Tokugawa period. 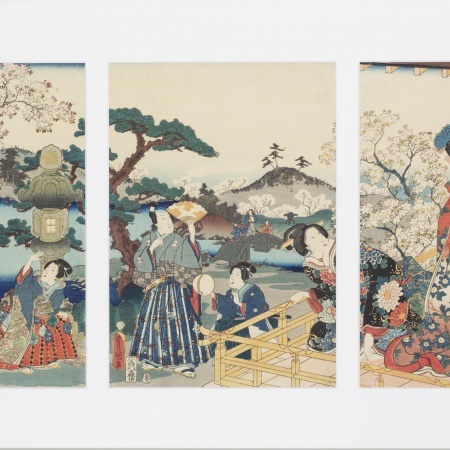 The artist’s rich output features prints of kabuki actors and beautiful women, and Cherryblossoms and Prince Genji at Rokujou, represents a masterful harmony of colour and composition in the best traditions of Japanese art. The art as a gift package can be upgraded with Suite categories, additional nights, transfers and other private services for a supplement.